As we work with new participants in The VentureCity’s growth program, one of the first things we do is to make sure that we share the same language when we agree on the goals for the program and define the set of metrics to measure. Most founders we work with come from an engineering or design background. We find that there is often a big divide between what people with a business background (marketing, sales, and finance) measure versus what people with a product/engineering background see as priorities. Successful startups bridge this divide by establishing a set of KPI’s that are shared and understood across different teams. We are launching a series of posts on the set of KPI’s that can be used for setting top-level goals across different teams in the company. This first post is dedicated to the Quick Ratio, a shortcut metric to define where the product stands in terms of growth that has been introduced by Social Capital in a series of blog posts that we recommend to read if you haven’t already. The ratio of the users added (new + resurrected) over the users lost (churned) is called the Quick Ratio. If a Quick Ratio is >1 the number of users is growing; conversely, if it is <1 the number of users is declining. The Quick Ratio is a shorthand way to combine growth, retention and churn into one number that describes how efficiently your product is growing. You can think about it as a way to measure ‘the heartbeat’ of your product as it shows you how many users are joining, staying and leaving in a given period. Most founders already measure churn for their product; however, churn is a relative metric. 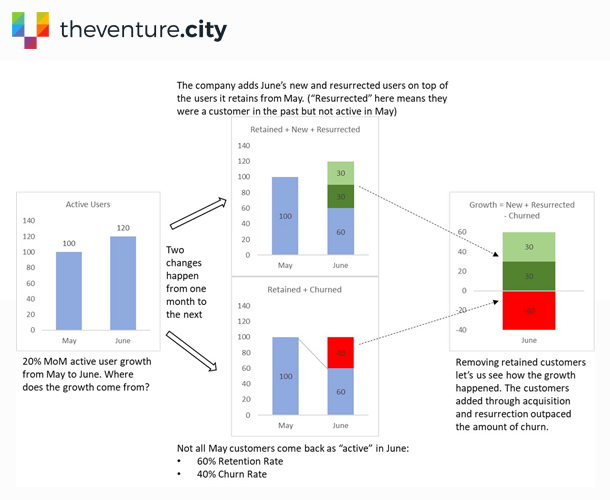 Bringing new customer acquisitions and resurrections of previously active customers into the picture and calculating Quick Ratio is a good way to put churn in perspective and understand the overall health of the product. If you have a portfolio of products you can use Quick Ratio to compare product performance across different products or benchmark your product versus the other products in the category as well as the different stages of product development. 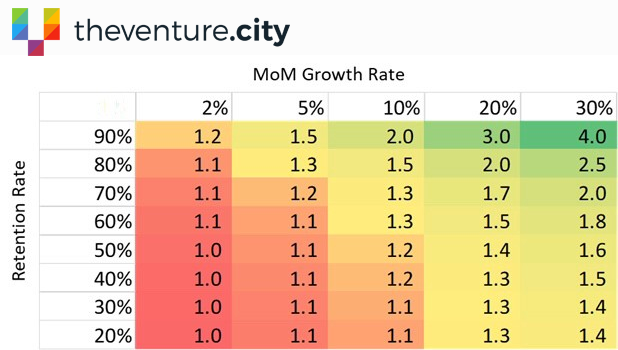 For example, we can compare the Company A — with its Quick Ratio of 1.5, monthly growth rate of 20% and user retention rate of 60% — with two other companies (B and C, below) that are also growing at 20% MoM, but with different retention rates. Of the three, Company C has the product with the highest Quick Ratio of 3. The product that Company C has brought to market has a high retention rate, so the team only needs to add 30 customers every month in order to keep growing at a 20% clip. Companies A and B, on the other hand, must step up user acquisition and bring 60 and 100 users respectively every month to achieve the same 20% growth. Quick Ratio can also help you prioritize your product and marketing efforts. This chart shows Quick Ratios at different user acquisition and retention rate combinations. The only way to achieve a high Quick Ratio for your product is to do well in both dimensions: user acquisition and retention. Understanding where your product lies on the above matrix helps inform where the team should be concentrating its product and marketing resources. If the product has high retention but low acquisition rate, your marketing team needs to step up their acquisition game. If the opposite is true and you are acquiring a big number of new users but not retaining them your product team needs to focus on finding new ways to keep them around in subsequent months to get more out of your marketing dollars. Last but not least — the reason why you might want to consider calculating Quick Ratio for your product is that VC’s are starting to use this metric to understand the performance of the companies they are evaluating investment in. It always pays off to look at the product through the same lens that is being used by those who are considering financing it. David Smith has written a script in R that can be used to calculate Quick Ratio for your product and put it on GitHub. We hope that you find it useful and will start using Quick Ratio as a way to monitor the growth of the product you are building. We hope this was helpful and let us know in the comments if you have any questions.